When Ryan Malone took his first few strides on Minneapolis’ frozen Lake Nokomis this weekend, he might as well have been gliding on the moon. Malone, who played in 647 NHL games, grew up in Pittsburgh. “There’s not a lot of pond hockey in Pittsburgh,” said the 38-year-old Malone, counting his outdoor skating opportunities as a kid on one hand. Yet on Sunday afternoon in the Open Division title game of the U.S. Pond Hockey Championships, the pond hockey rookie played the part of a savvy veteran – routinely winning one-on-one battles on the boards, coolly flipping saucer passes to teammates and regularly firing precision shots into the wooden boxes that serve as the goals. 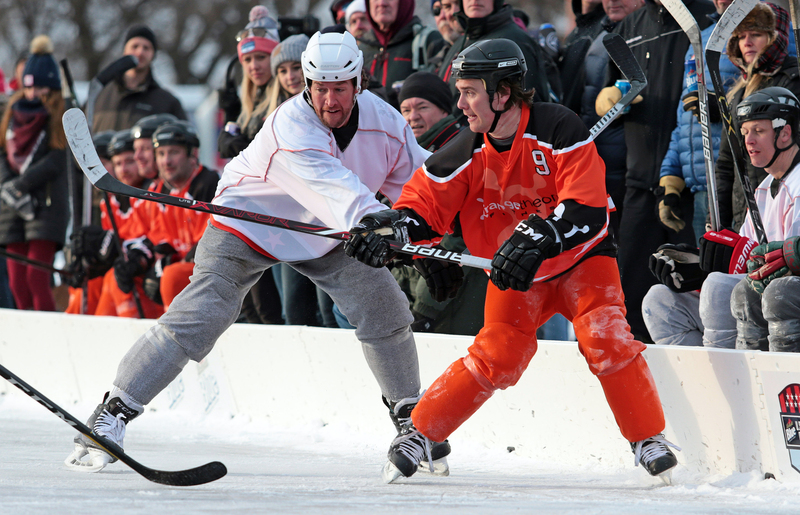 “It’s amazing that, for a guy who has never played pond hockey, he looked like an absolute natural out there,” said Wright Homes-Four Star Hockey defenseman and co-founder Dave Bakken after the 6-foot-4 Malone scored three goals in a 10-4 triumph over Orange Theory Fitness. The Open Division title was the third straight and eighth overall for Wright Homes-Four Star Hockey in the 13-year history of the event. It probably wasn’t the biggest victory in Malone’s career, considering he was a standout at St. Cloud State University, played parts of 11 seasons in the NHL and won a silver medal at the 2010 Vancouver Winter Games. Malone, who came out of a two-year retirement to try out for the Minnesota Wild this fall, played 12 games for the Iowa Wild in the American Hockey League this winter. He reportedly was a contender to make this year’s U.S. men’s Olympic hockey team and, who knows, might still have have a shot of playing in PyeongChang as a last-minute injury replacement. That sort of emergency call-up wouldn’t be unprecedented. Malone, after all, just proved to be the pond’s ultimate injury replacement. When Wright Homes-Four Star Hockey lost Steve Brown to an injury just days before the tournament, Bakken said the team was scrambling to find a player, any player, to fill in. Geno Parrish, Wright Homes-Four Star Hockey's longtime defenseman, suggested he give friend and former St. Cloud State teammate Malone a call to check on his availability. “I wasn’t doing anything, so I said, ‘Sure, I’ll play,’ ” said Malone, who lives in Wayzata and is raising two hockey obsessed boys, Will, 9, and Cooper, 7. Malone scored a goal in a tight first half that ended with the score tied at 2. He scored again in the second half to put Wright Homes-Four Star Hockey ahead 6-2 and added another goal in the closing minute. “He, of course, is really large,” Wright Homes-Four Star Hockey forward Steve Aronson, who also scored three goals in Sunday’s triumph, said about Malone. “But he has such soft hands. He’s a good playmaker. He’s really fun to watch." A reincarnation of the old Surge Cycling/Red Army team that won the Open Division title in 2015, Orange Theory Fitness was the No. 3 seed entering Sunday’s championship round (Wright Homes/Four Star Hockey was seeded fifth). Led by the brilliant play of speedster Kyle Kurr, an Elk River native who starred at Hamline University, Orange Theory Fitness won its four pool play games by a combined score of 48-16, then reeled off wins over Malone’s Bar, MGK T&A and Stewart’s Duluth to reach the title game. The 5-foot-7 Kurr opened the scoring on Sunday, but found little room to maneuver in the second half when he often found himself staring up at and attempting to spin away from the hulking Malone. Early second-half goals by Randy Gallatin, on a breakaway after an uncharacteristic lapse in the Orange Theory Fitness defense, and Aronson gave Wright Homes/Four Star Hockey a 4-2 cushion. Orange Theory Fitness was on its heels and off its game the rest of the afternoon. “I think we just played intimidated once they got up a goal or two on us,” Kurr said. “Wright Homes did their thing, they did what they usually do, they kind of bullied us around a little bit. And, of course, it never hurts to call in a former NHL player who scored 20 or more goals in six seasons. Especially one like Malone, who takes to the pond as if he was born with ice water in his veins. Other NHL players have given pond hockey a try with only varying degrees of success. Last year the SJ Stonefish, featuring longtime NHLer Mike Ricci, lost all four of its pool play games. Former Minnesota Wild star Andrew Brunette competed in the Open Division but, like Ricci, wasn’t on a contending team. Other past NHLers who have played on the pond include Phil Housley, Tom Chorske, Brian Bellows and John Madden. Malone said the smaller pond hockey ice surface, which puts an emphasis on positioning and puck control, suits his strengths. 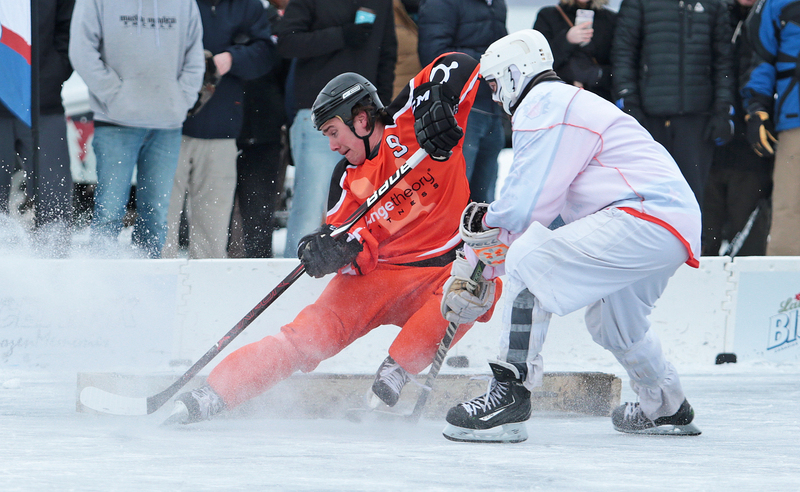 Since both Wright Homes/Four Star Hockey and Orange Theory Fitness wear orange jerseys -- and brought no backups to the title game -- Wright Homes/Four Star Hockey, in true pond hockey fashion, wore its jerseys inside out. … Longtime Wright Homes/Four Star Hockey defenseman Geno Parrish, renowned for wearing his Mexican-styled wrestling mask under his helmet, was clipped by a wayward stick near the end of the first half and suffered a nasty cut on his mouth. Wright Homes/Four Star Hockey received a penalty shot (Aaron Gill missed on the attempt) after what was ruled to be an inadvertent high stick. Parrish, who was bleeding profusely, did not play the rest of the game, but he did return to the ice in time to be included in the team photo after the game (he's the one with the blood-stained jersey). 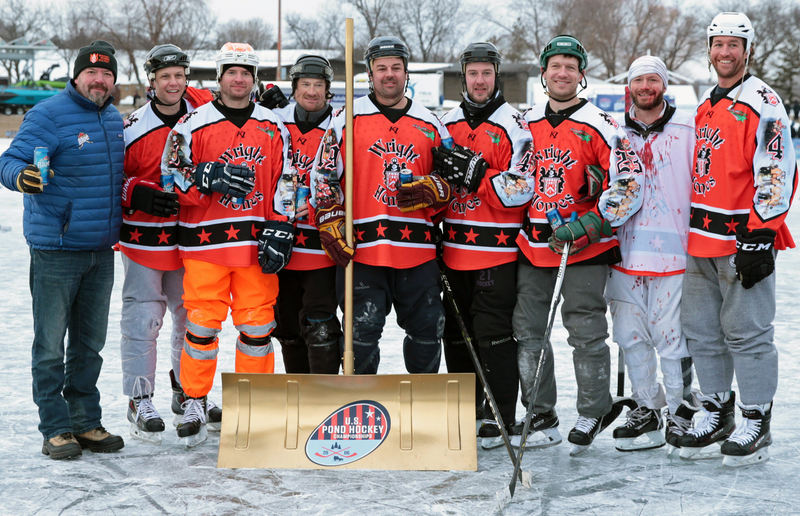 … In an achievement that is unlikely to be matched anytime soon, longtime Wright Homes/Four Star Hockey defenseman and co-founder Dave Bakken became the first player on an Open Division championship team to be 50 years old or older. Bakken turned 50 last year. Boozy Buddies, a team of several recent St. Olaf College players, won the Cedar Division championship with a 10-6 triumph over jordanwatches.com in the title game. … Tradition Mortgage won its fourth-straight 40-Plus Division title by beating 10 Meter Radius 6-4 in the championship game. 10 Meter Radius, which for years had been a top team in the Open Division, had defeated Tradition Mortgage 6-4 in a pool-play game on Saturday. … First-time tournament entrant Lululemon, a team comprised mostly of former Olympians and national collegiate champions, including the likes of Natalie Darwitz and Krissy Wendell-Pohl, won the Women’s Division with a 14-8 triumph over Top Shelf Tricks. Lululemon squeaked past two-time defending women’s champion Bigger, Redder, Older and Colder 8-7 in the semifinals. ... Evan Williams Single Barrel defended its Sundown Showdown title by winning five consecutive games on Saturday night, including a 4-2 triumph over the Dekes of Hazard in the championship game of the mini-tournament within the tournament. Evan Williams Single Barrel moved up to the Open Division this year after going 15-0 last year en route to Sundown Showdown and Cedar Division titles. … Saucy Twigs beat Vanek! at the Disco 7-6 to win the Rink Rat Division.